​Investor Ready Energy Efficiency™ (IREE) designation ensures that a specific project conforms to the ICP protocols. IREE projects must be developed by an ICP Project Developer and must contain a complete ICP Protocol documentation package that includes sign off by an engineer of record from the project development team. Furthermore, IREE project must have undergone quality assurance review by an independent and qualified ICP Quality Assurance Assessor who certifies that the project meets the requirements set forth in the ICP Quality Assurance Checklist and ICP Project Development Specification. 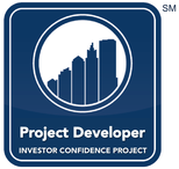 ​The ICP Project Developer is a project developer (ESCO, Engineering firm, facility manager, building owner, etc.) who is capable of meeting the requirements that are outlined in the ICP Energy Performance Protocols. Each firm needs to have a licensed engineer either on staff or under contract, qualified to certify projects as complying with the requirements of the ICP Energy Performance Protocols. The ICP Project Developer is the crucial first step in the process of developing IREE projects. We are actively recruiting experienced project developers who have the skills and qualifications necessary to originate high-quality project. For more information on requirements and program benefits check the PD Network pages or please contact us here. ​The ICP Quality Assurance Assessor (previously Quality Assurance 'Provider') designates an organisation that has all necessary qualifications and certifications to provide Quality Assurance for a project developed according to the ICP Energy Performance Protocols leveraging the ICP Project Development Specification and QA Checklist. Furthermore, this designation requires that the QA provider attest that they are an independent third-party with no affiliation to each project as part of the QA process. If you are interested in this programme and its requirements please check the QA Network pages or contact us here. Use ICP Investor Ready Energy Efficiency™ Logo: Logo may be affixed to qualifying IREE project documents. Modifications to the documentation package require re-certification by a designated ICP Quality Assurance Assessor. All digital assets displaying ICP IREE logo are required to link back to corresponding protocol on the ICP website. Use of Provider Logos: All digital assets displaying credential logos shall be hyperlinked to the corresponding Self Qualification form posted on the ICP website.